iOS 9.3 brings Dolby Digital Plus 7.1 to iPad, iPhone, iPod | What Hi-Fi? Amidst the furore of two new iDevices at Apple’s March launch event, the company also added support for Dolby Digital Plus 7.1 with the latest iteration of iOS 9. The new iPhone SE and iPad Pro 9.7 may have stolen the headlines at Apple's March event, but there was also an interesting update within iOS 9.3 - support for Dolby Digital Plus in 7.1-channel audio. The update is available for compatible iPhone, iPad and iPod Touch models and allows you to enjoy movies and TVs show that have a Dolby Audio soundtrack in their full glory. If you're wondering how you'd benefit on a 4-inch phone, you can of course hook your iOS device up to an AV receiver using Apple’s Lightning to AV Adapter. 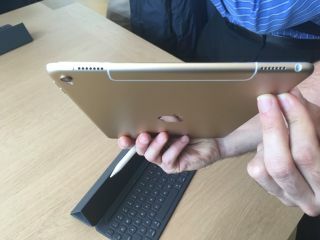 And despite the new iPad Pro 9.7 sporting the same four-speaker system that can be found in the larger iPad Pro, we think this is probably the better audio news for Apple-loving AV fans. All devices that were able to support iOS 8, including the iPhone 4S, iPad 2 and the first generation iPad Mini, will get this latest update. The latest version of the Apple TV streaming box was given the gift of 7.1 Dolby Digital decoding at the end of last year, an improvement on the 5.1 Dolby Digital pass through available on the previous model.